Of course, the serious budget busters lie in the future. 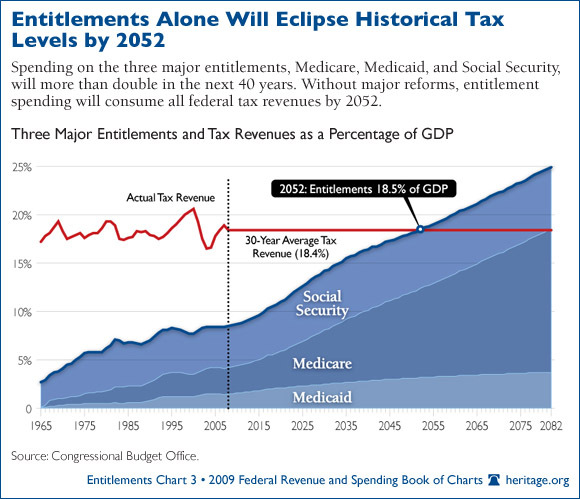 Esp Medicare, as seen in this bit of propaganda from the Heritage Foundation (source). Of course, this forecast is specious — we’ll change the system when the costs become intolerable. For a different perspective, what would this graph look like with DoD’s cost forecast included? Great set of articles, FM. Keep up the good work! I particularly liked the first and the last articles. But spending is 100% controllable, whereas revenue is not. Increasing spending while revenues decrease makes it an even worse idea. Plus, as exampled in the previous subway post, our government does not spend money wisely. FM reply: There is no way to reply to this, other than suggest you read an Economics 101 text, or take the course online. Economics for 70 years has been based on counter-cyclical spending. The Great Depression was a test of your “liquidationist” beliefs (named after Andrew Mellon’s version our your advice). The recovery began in each nation when they abandoned that policy and initiated stimulus programs (see here for great graph). Full recovery arrived in the US with that stimulus program known as WWII. Since then nobody has sought to repeat the experiment. Please don’t give the know-nothing “economics are fools” reply. I’ve lost patience with ignorance, and delete “flat earth” rebuttals. (that’s not assuming that you will so reply, it’s a standard warning). Definitely worrisome if there is a connection between external debt above 60% GDP & low growth rates also for advanced economies. As the Reinhart and Rogoff paper shows for developing nations. Bad in particular for Europe. Experts at work, don’t try this at home, kids. Since earlier in the article Maxine Udall mentions Lake Michigan, I would assume we are speaking of Milton Friedman. I think Milton Friedman would say that the primary duty of the central bank is to control the overall rate of inflation. Unfortunately, the government and Fed invented something called “equivalent rents” so they could insulate the rate of inflation from the housing market, which started to skyrocket in the late 1990’s. So our interest rates stayed low, and the price of houses kept increasing. And if the Fed really wanted to, they could include assets like stocks in the rate of inflation as well, since they are also used as collateral for loans. All we got from Greenspan and the fed were speeches about irrational exuberance until it was too late. I would suggest another opinion: “Bernanke’s fearful asymmetry“, James Saft, op-ed at Reuters, 5 January 2010. FM reply: By “Lake Michigan” they author means the Chicago School of Economics — aka “freshwater” economics, vs. mainstream “saltwater” economics of the coastal universities. Friedman’s theories are an important element, but the more relevant aspect is their laissez faire view of government regulation and counter-cyclical stimulus. Instead they have faith in extreme version of the far more limited “invisible hand” of Adam Smith, the efficient markets theory (now largely discredited, except by true believers). No. Until 1983, the CPI measure of homeowner cost was based largely on house prices. The long-recognized flaw of that approach was that owner-occupied housing combines both consumption and investment elements, and the CPI is designed to exclude investment items. The approach now used in the CPI, called rental equivalence, measures the value of shelter to owner-occupants as the amount they forgo by not renting out their homes. The rental equivalence approach is grounded in economic theory, receives broad support from academic economists and each of the prominent panels, and agencies that have reviewed the CPI, and is the most commonly used method by countries in the Organization for Economic Cooperation and Development (OECD). Critics often assume that the BLS adopted rental equivalence in order to lower the measured rate of inflation. It is certainly true that an index based on home prices would be more volatile, and might move differently from other CPI indexes over any given time period. However, when it was first introduced, rental equivalence actually increased the rate of change of the CPI shelter index, and in the long run there is no evidence that the CPI method yields lower inflation rates than some other alternatives. For example, according to the National Association of Realtors, between 1983 and 2007 the monthly principal and interest payment required to purchase a median-priced existing home in the United States rose by 79%, much less than the rental equivalence increase of 140 percent over that same period. It is quite convenient to say that the monthly payment went up by only a small percentage compared to rent. Does that include 2nd mortgages. I can’t take out a 2nd mortage on a rental. The value of houses affects money supply. FM reply: No, the value of asset prices (e.g., homes) does not affect the money supply. One of the reasons payments for houses were low was because of low interest rates. This allowed ever increasing leverage. FM reply: Yes, that was the key factor. Federal Reserve research in 2006-07 said that there was no housing bubble, assuming continued low interest rates — and ignoring the effect of excess building. The latter crashed home prices. The former (rising interest rates) might crash them even lower (I don’t believe this will happen during the next few years, but nobody can reliabley forecast rates).